Feast your eyes on this trip – £110 for 2 days coaching, loan of Sea Kayak and paddle and Bunk house accommodation ! Its an absolute bargain – any cheaper and they`d be giving it away . 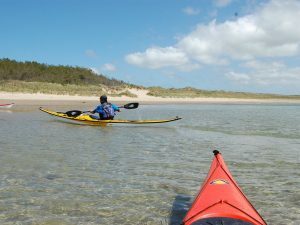 No previous Sea Kayaking experience is needed but it is expected that you will have completed a Summer course at the club and have run the white water course , are comfortable capsizing and exiting a kayak . The top class coaching will be led Eila Wilkinson of Tidal waters/ Sea kayaking UK and is strictly limited to 6 places and interest is expected to very high for this weekend. Contact Liane – liane.llewellyn@btinternet.com for more information and to book a spot . Give it a go – You know you want to .